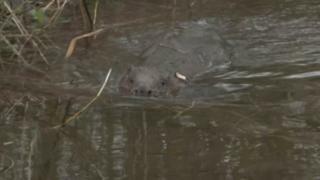 A pair of beavers have been released back into the wild in Essex for the first time in 400 years. The two Eurasian Beavers have a new territory covering four hectares at Spains Hall Estate in Finchingfield, to work as flood engineers. The Environment Agency said it was a "pioneering approach" to reduce local flooding and also improve biodiversity. The mammals were hunted to extinction in England centuries ago but have since been gradually reintroduced. The Environment Agency, working with the estate, the Essex & Suffolk Rivers Trust and Essex Wildlife Trust, said the mammal had been reintroduced in small numbers in other parts of the country in recent years, but this is a first for Essex. Archie Ruggles-Brise, owner of the estate, said: "Being able to pit nature against man to see who does it better will be a rare chance to learn and adapt our approach." Matt Butcher, from the Environment Agency, said: "Introducing leaky dams along Finchingfield Brook should slow the flow and reduce flood peaks downstream whilst improving habitat in this fantastic landscape. "The beavers bring another exciting dimension, as we can assess how effective they are at creating amazing new wetlands." He said he hoped the mammals would work to build natural flood defences in areas where traditional defences are not appropriate. Beavers were hunted to extinction for their fur, meat and scent glands in the beginning of the 16th century in England.